Taking a long road trip when your eyes are tired can make the navigator’s job a little difficult. After all the driver doesn’t need a light distracting them from the task at hand, but someone has to guide things along. There are those cases when despite that I own a GPS unit, I prefer to drag out the map. Thankfully there is now a light that won’t bother the driver quite as much as the extremely bright overhead lights. This light just pops into your car’s cigarette lighter like every other gadget meant to be used in your car. The staff of the light is very bendable, so you can get the proper angle that won’t disturb the driver. You could also use it for when you need to search for something that you’ve dropped or just want to be able to read a book. 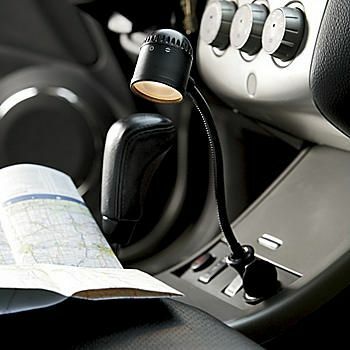 You can purchase the 12V Flexible Map Light for $14.95 through Seventh Avenue.